Dermatologic diseases comprise about 20% of a practitioner’s caseload. While many skin diseases are allergic or infectious, skin lesions can also be manifestations of internal disease. The skin has many functions, including thermoregulation, camouflage, and protection, but one of its most interesting purposes is its function as a marker of internal disease.2,3 While many skin and ear diseases of dogs and cats are allergic (eg, atopy, food allergy, flea allergy) or infectious (eg, bacterial or yeast pyoderma/otitis, dermatophytosis), skin lesions can also be manifestations of internal disease. 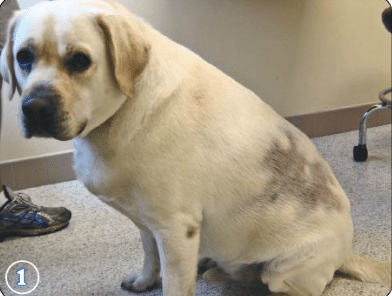 Pet owners may see skin lesions long before bringing their pets to the veterinarian. With a thorough history and physical examination, these lesions, along with other nondermatologic signs, can help identify underlying disease. Poor or rough hair coat. In most patients, with appropriate diagnosis and case management, such as thyroid hormone replacement, dermatologic signs will slowly resolve in a 6- to 8-week period. Hyperadrenocorticism (Cushing’s disease) is a very common endocrinopathy. Naturally occurring hyperadrenocorticism is most often seen in middle-aged to older dogs. Dachshunds, Boston terriers, poodles, and boxers have a higher incidence of disease,6 and studies point to a higher incidence in female dogs. This disease often presents in my practice with only dermatologic signs. Many cases have normal serum biochemistry and complete blood count values, although some will have the “classic” elevated serum alkaline phosphatase and stress leukogram. 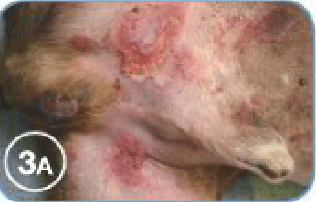 Very commonly, nonpruritic pyoderma (Figure 2). There are several diagnostic tests for hyperadrenocorticism. Adrenal function tests are most commonly used, including the adrenocorticotropic stimulation test and low-dose dexamethasone suppression test. Urinary cortisol:creatinine ratio evaluation can also be performed; a level greater than 13 is typically diagnostic for canine hyperadrenocorticism. If using this diagnostic test, a plasma cortisol value is needed as a starting point. Pruritus is variable; however, most cases are moderately pruritic. I have also seen bilaterally symmetric nodules on the preauricular region. Calcinosis cutis is definitively diagnosed through skin biopsy that shows calcium deposition in the tissue. Direct application of DMSO gel to affected areas once daily to assist with mineral dissolution. Serum calcium levels should be monitored as calcium release from the larger nidus of calcium in the tissue may elevate levels. The dermatologic sign most commonly seen is nonpruritic truncal alopecia, which spares the head and distal extremities (Figure 4). In some cases, bacteria pyoderma and yeast can be seen cytologically. Taking skin biopsies to help rule out other dermatologic conditions. It has been hypothesized that pain associated with hypocalcemia in the masseter and temporal muscles, which causes cramping and possibly a “tingling” sensation around the mouth, is responsible for pruritus. Cases present with tearing of very thin and fragile skin that lacks hyperextensibility, which is in contrast to the hyperextensibility of the skin seen in Ehlers-Danlos syndrome or dermatosparaxis—rare dermatoses in cats that are differential diagnoses for acquired skin fragility syndrome. 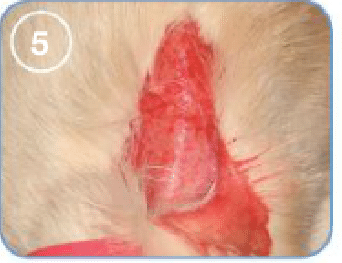 Many times the tearing is initially seen when the cat is “scruffed” for routine restraint (Figure 5). Identifying and treating the underlying condition is crucial to therapy, but diagnosis and management of these diseases can sometimes be challenging. Treatment also involves avoidance of trauma to the skin (eg, avoiding restraint, cats fighting/playing). Paraneoplastic pemphigus is a rare blistering disease that affects the mucocutaneous junctional areas (eg, oral and genital orifices) along with haired skin. Thymic lymphoma and splenic sarcomas have been reported as underlying neoplastic conditions. Diagnosis requires a skin biopsy and, likely, immunologic staining. 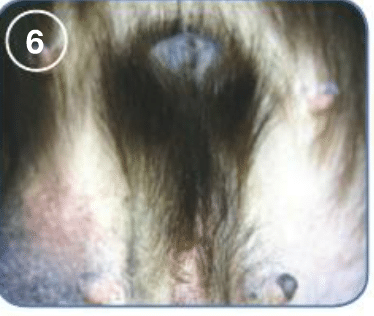 Testicular neoplasias, such as Sertoli cell tumors, are seen most commonly in cryptorchid male dogs in association with feminization syndrome. The clinical sign linear preputial erythema, in which a linear erythematous band runs along the preputial region, has been seen in cases of Sertoli cell tumors (Figure 6). Removal of the affected testis commonly results in resolution of hyperestrogenism. 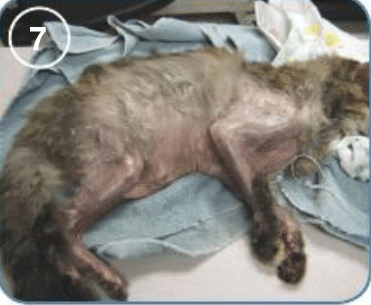 Feline paraneoplastic alopecia is an uncommon skin disease; however, it is usually easy to recognize in affected cats. Its underlying cause is usually pancreatic adenocarcinoma or bile duct carcinoma. These cats have extremely shiny to glistening alopecic skin that is dry with a very smooth texture (Figure 7); common areas affected include the ventrum, legs, and face. Feline thymoma-associated exfoliative dermatitis is a rare disease seen in middle-aged to older cats. 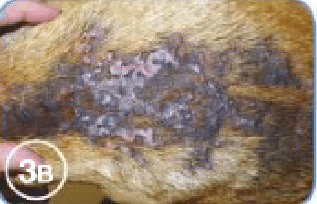 Nodular dermatofibrosis (collagenous nevi) has been associated with renal cystadenocarcinomas or cystadenomas, most often in German shepherd dogs or crosses. Multiple nodules, which may be relatively symmetrical, are found on the distal extremities. These nodules may ulcerate, creating pain and lameness. Treatment is either benign neglect with observation or surgical tumor removal. Hepatocutaneous syndrome, also referred to as superficial necrolytic dermatitis, necrolytic migratory erythema, and metabolic epidermal necrosis, is an uncommon disease in both dogs and cats. 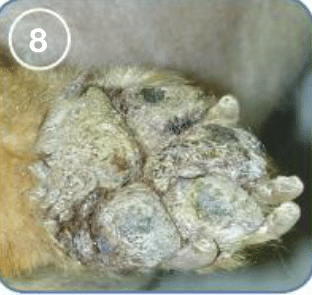 The paw pads are most commonly affected, with extreme thickening, pad margin proliferation, and fissures (Figure 8). In addition, crusting, erosions, and ulcerations can be present at the mucocutaneous junctions of the perioral and perigenital regions. Blood analysis, with elevated blood glucose and normocytic, normochromic nonregenerative anemia. Treatment is focused on management of pancreatic or liver disease. Many clinicians have implemented intravenous amino acid infusions and dietary modifications to help with disease control. Aminosyn 10% (hospira.com) is used for IV infusions (see reference 19 for further details). A high-protein diet with essential fatty acids may be helpful; commercial diets and home-prepared diets have been used.19 Consultation with a veterinary nutritionist is helpful, especially if the owner chooses to feed a home-prepared diet. Hill PB, Lo A, Eden CAN, et al. Survey of the prevalence, diagnosis and treatment of dermatological conditions in small animals in general practice. Vet Rec 2006; 158:533-539. Miller WH, Griffin CE, Campbell KL. Structure and function of the skin. Muller & Kirk’s Small Animal Dermatology, 7th ed. St. Louis: Saunders, 2013, p 1. Outerbridge C. Cutaneous manifestations of internal diseases. Vet Clin North Am Small Anim Pract 2013; 43:135-152. Scott-Moncrieff JC. Clinical signs and concurrent diseases of hypothyroidism in dogs and cats. Vet Clin North Am Small Anim Pract 2007; 37:709-722. Miller WH, Griffin CE, Campbell KL. Endocrine and metabolic diseases. Muller & Kirk’s Small Animal Dermatology, 7th ed. St. Louis: Saunders, 2013, p 503. Miller WH, Griffin CE, Campbell KL. Endocrine and metabolic diseases. Muller & Kirk’s Small Animal Dermatology, 7th ed. St. Louis: Saunders, 2013, pp 515-525. Zur G, White SD. 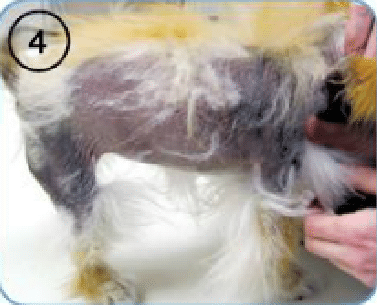 Hyperadrenocorticism in 10 dogs with skin lesions as the only presenting clinical signs. JAAHA 2011; 47:419-427. Miller WH, Griffin CE, Campbell KL. Neoplastic and non-neoplastic tumors. Muller & Kirk’s Small Animal Dermatology, 7th ed. St. Louis: Saunders, 2013, pp 827-833. Behrend EN, Kennis R. Atypical cushing’s syndrome in dogs: Arguments for and against. Vet Clin N Am Small Anim Pract 2010; 40:285-296. Frank LA, Hnilica KA, Oliver JW. Adrenal steroid hormone concentrations in dogs with hair cycle arrest (Alopecia X) before and during treatment with melatonin and mitotane. Vet Derm 2004; 15:278-284. Miller WH, Griffin CE, Campbell KL. Endocrine and metabolic diseases. Muller & Kirk’s Small Animal Dermatology, 7th ed. St. Louis: Saunders, 2013, p 532-540. Feldman EC, Nelson RW. Hypocalcemia and primary hypoparathyroidism. Canine and Endocrinology and Reproduction, 3rd ed. St. Louis: Saunders, 2004, pp 716-742. Ettinger SJ, Feldman EC. Disorders of the parathyroid gland. Textbook of Veterinary Internal Medicine, 6th ed. St. Louis: Saunders, 2005, p 1529. Plumb DC. Plumb’s Veterinary Drug Handbook, 7th ed. Indianapolis, IN: Wiley-Blackwell, 2011. Miller WH, Griffin CE, Campbell KL. Miscellaneous skin diseases. Muller & Kirk’s Small Animal Dermatology, 7th ed. St. Louis: Saunders, 2013, p 714. Crosaz O, Vilaplana-Grosso F, Alleaume C, et al. Skin fragility syndrome in a cat with multicentric follicular lymphoma. J Fel Med Surg 2013; epub ahead of print. Daniel AG, Lucas SR, Júnior AR, et al. Skin fragility syndrome in a cat with cholangiohepatitis and hepatic lipidosis. J Fel Med Surg 2010; 12:151-155. Miller WH, Griffin CE, Campbell KL. Miscellaneous alopecias. Muller & Kirk’s Small Animal Dermatology, 7th ed. St. Louis: Saunders, 2013, pp 568-569. Miller WH, Griffin CE, Campbell KL. Endocrine and metabolic diseases. Muller & Kirk’s Small Animal Dermatology, 7th ed. St. Louis: Saunders, 2013, pp 540-542. Chris Reeder, DVM, Diplomate ACVD, is a co-owner and senior dermatologist at Animal Dermatology Clinic Louisville, where he helps train veterinary students, interns, and residents, and co-owner of Animal Dermatology Clinic Indianapolis. He also practices at several satellite locations. His special interests include immune-mediated skin diseases, otitis externa, and dermatopathology. Dr. Reeder has published several articles in national and international publications and enjoys lecturing to local and national audiences on dermatology. He has served on the Credentials Committee and several ad hoc committees for the American College of Veterinary Dermatology.